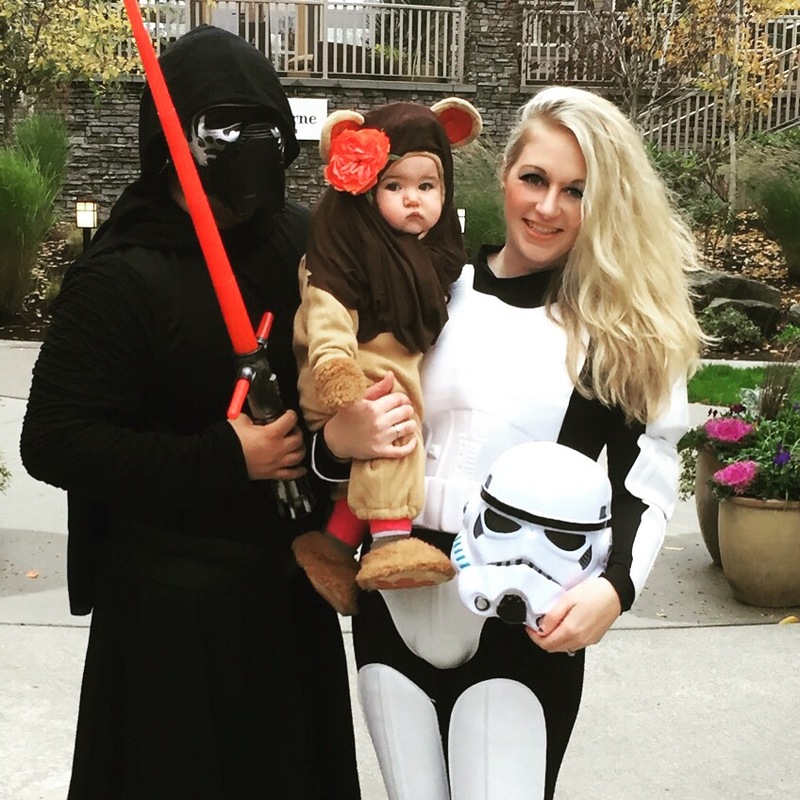 DIY Baby Ewok Halloween Costume – Abbey Co. Seriously, look at that little baby Ewok and tell me that isn’t the sweetest thing you have ever seen, I dare you! My husband and I have done some pretty good couples costumes in the past when it was just the two of us, but we decided now having 3 in our family it would be a little more epic to continue doing a ‘family theme’. We are big Star Wars nerds, so picking a theme was easy! My daughter is a brunette, but was relatively bald at this point, so that ruled out her as Princess Leia. Hubby and I found our costumes easily online, but I wasn’t happy with the selection for babies. Thanks to Pinterest I was able to get some inspiration for her and this is what we ended up with! 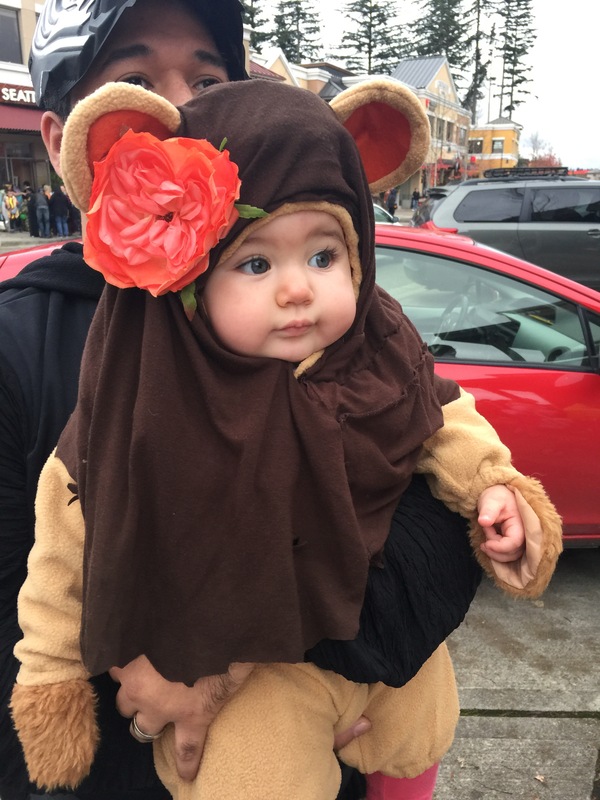 So, here is my easy tutorial on how to make your own Ewok costume for your little one! *since this is my child, I am not comfortable with people just sharing pictures from this post. If you would like to share this idea, please share the whole post, or pin the post only. Thank you for respecting my pictures! Start with the lion costume as your base. I found this easiest to assemble when my daughter was wearing it so that the head piece had form. Of course, I wouldn’t hot glue the costume while they are wearing it, but starting this way helps. With my daughter wearing the lion costume head piece, I draped the brown fabric over the top. Make sure that the fabric drapes down to their shoulders. If it goes too far, don’t worry, you can just trim it once assembled! Cut slits in the brown fabric where the lion ears are, and pull the ears through. Once you have a feel for where you want things to lay, take the head piece off and start hot gluing the bottom of the brown fabric to the lion head. Be especially sure to line the edge of the hood so that the brown fabric stays put around your child’s face. A note about this part, I had initially thought about cutting the lion mane off, but first that was a lot of work, and second I realized I liked the volume it gave to the costume, making it look more ewok-ish. The last steps are easy! I snipped off the lion tail, and hot glued on the flower. Then, voila! The cutest thing ever. If you want to make this costume yourself but have questions about it, be sure to comment, I am happy to help! Omg I love that you guys all dressed up and did a Star Wars theme together! That’s awesome!! We figured we have very few years where we can get away with family costumes before she is too cool for us, so we are going for it! Thank you! She was pretty darn cute! This is so cute!! My kiddo was a lion last year, this is very creative! Thank you! I agree that it is pretty darn cute! Next PostNext A Family Fun Day With Goodwill – Learning and Thrifting Some Super Fun Halloween Costumes!